Reverend John Felix, priest at the Armenian church in Yangon, also known as Rangoon, can't speak Armenian. He was born in Myanmar, speaks Burmese, but is of south Indian origin. 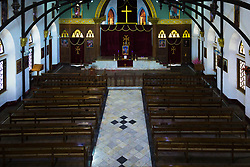 The Armenian Orthodox Church of St John the Baptist is 150 years old. 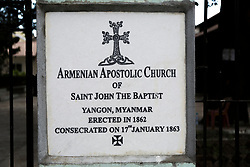 The congregation these days is small, in single figures.There used to be a few hundred Armenian families in Burma but the last 'full' Armenian died in 2013. There are now no more than 10 or 20 families who are part Armenian. In the early 17th Century, large numbers of Armenians fled the Ottoman Empire and settled in Isfahan in what's now Iran. From there, many travelled to form a commercial network from Amsterdam to Manila. 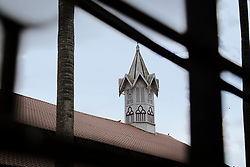 Their influence in the British Raj reached its peak in the late 19th Century, when census records suggest that about 1,300 Armenians were living principally in Calcutta, Dhaka and Rangoon. Their closeness to the Burmese royal court gave them a particularly privileged status in Rangoon's trading community. The land on which the church stands was given to the Armenians by Burma's king. The region's most prestigious hotels, including The Strand a short walk from the church in downtown Yangon, and the Raffles in Singapore, were established by Armenians. Worried by political and economic instability, many Armenians moved to Australia.